This cabinet provides room for your new Home Theater component system when you have limited wall space. 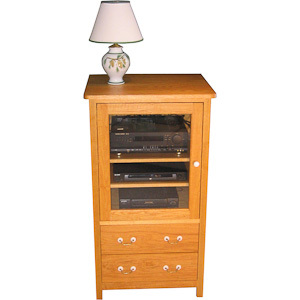 The three-shelf unit utilizes a vertical compartment for housing your Audio/Visual Receiver, DVD/CD player and Satellite/set-top box controller. The shelves are fully adjustable to set to the height of your components. A channel way on the back of each shelf is available to thread wires to neighboring components on other shelves. The back has a wiring opening on the top and bottom to route wires to your speakers, monitor and other devices. Ventilation openings are provided for cooling. The unit comes standard with three component shelves. The CD drawer can hold between 210 to 240 CDs for two drawers. A drawer can be designed to hold accessories with individual compartments for cables and accessories. At the time of ordering please specify the types of drawers (for CDs or accessories). A glass door is provided to fully enclose your components. It is highly recommended that additional forced air cooling using fans be used to keep your components at a comfortable operating temperature. Optionally a set of whisper quiet fans can be added to insure better air circulation for higher power AVR equipment.